Home » Why Choose Two Storey Homes? Single storey homes are still the “traditional” type of home in WA, however the popularity of two storey homes is growing and there are times when the benefits of buying two storey homes in Perth become too good to overlook. There are hundreds of beautiful two storey house designs of all shapes, sizes, materials and prices available from dozens of builders throughout Perth and WA. You can choose from basic, small 2 storey home plans right through to elaborate, luxurious abodes with all the trimmings and everything in between! The benefits of building double storey homes in Perth include street presence (double storey houses look more substantial and impressive), multiple living options (bedrooms upstairs with downstairs living/ parent’s retreat upstairs, kids downstairs/ family business downstairs, bedrooms & living upstairs and so on), building up instead of out could save you backyard space to install a pool, build a patio entertaining area or create your dream garden and of course double storey homes offer you a view of your surroundings which is ideal for coastal living, rural settings, the hills overlooking Perth city, or living near rivers, lakes and canals. Two storey homes are not generally well accepted by the elderly due to not being able to climb stairs, but for those willing to pay the money there are options available to assist the elderly to access their upper level such as elevators or chair lifts. 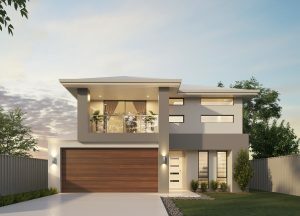 Often the assumption that two storey houses are much more costly than single storey homes is enough to deter buyers however Great Living Homes in Mandurah have developed a unique method of construction which enables them to build two storey designs at extremely competitive prices. Additionally they offer a wide choice of materials to assist with cost reduction and they are more than willing to alter floor plans to suit individual buyers in order to make more affordable 2 storey homes. The new technology used by Great Living Homes involves building the upper floor on the ground first and lifting it up in the air to finish building underneath. This method means all work is completed on ground level which provides a safer work environment, it also means they do not need to use scaffolding, cranes or other bulky and hazardous equipment thereby reducing costs and providing a cleaner and more accessible work site. If you are considering building a two storey home in Perth, it is definitely worth having a chat with the team at Great Living Homes.